Brenuin longs for the taste of Argonian Ale. Can you steal some for him? Meet Brenuin on the streets of Whiterun. Go to The Bannered Mare and acquire the Argonian Ale. Return to Brenuin to be rewarded. After you give Brenuin a gold coin on the streets of Whiterun, the option to ask him if he is always drunk will become available. Ask him, and he will reply "Only if I can help it." He then asks you to bring him a special bottle of ale: "In the Bannered Mare, there's this bottle of Argonian Ale. The good stuff. Get it for me." 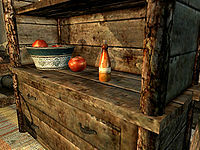 The inn is in the market area of Whiterun's Plains District, where Brenuin usually pesters the stall owners outside the inn or customers inside. The ale is in the inn's kitchen (to the left from the main entrance), on the cupboard opposite the cooking spit. Alternatively, the ale can be obtained by raising the disposition of the innkeeper Hulda. This can be done by chopping wood outside the inn and selling it to Hulda. Her disposition will then be high enough that she allows you to take low-value items from the inn without it being theft. This includes the bottle of Argonian Ale. After acquiring the ale, return to Brenuin. He will thank you and reward you with a Potion of Vigorous Healing that he had recently "obtained" from the Temple of Kynareth, or as he puts it: "I, er, "found" it in the temple." You can refuse to feed his habit when he asks you to steal the ale, though this does not lock you out of the quest as the option still remains to discuss his sobriety later. The amount of wood given to Hulda does not matter, her disposition will be raised even if you sold just one piece. The following empty quest stages were omitted from the table: 0, 255, 500. On the PC, it is possible to use the console to advance through the quest by entering setstage FreeformWhiterunQuest02 stage, where stage is the number of the stage you wish to complete. It is not possible to un-complete (i.e. go back) quest stages, but it is possible to clear all stages of the quest using resetquest FreeformWhiterunQuest02. This page was last modified on 23 January 2018, at 19:32.